We all know listening to your customers is important. Not just reading their comments, but talking to them, actually getting in a room with them, and having them test your product. But if basing a whole-scale redesign around one series of user conversations makes you nervous – it should. That’s because sometimes when we listen, we only see a bit of the bigger picture. It’s only when we get customer feedback, tweak the design, and THEN ask customers a second time that we really validate what customers want. Retesting is called iteration and it’s very powerful. At every stage of their development, they took the new design and opened it up for feedback. They took this feedback, tweaked, and asked again. And again. Over time, as you can see in this usability case study, the design got stronger and stronger. The initial design, above, is a fairly straightforward informational website. To move it to the next level, they used a combination of face-to-face usability testing and remote tests. “Over the previous year, some people had complained about Data.gov being hard to use, and so I asked them to be testers. Most of them accepted,” said Jeanne Holm, open data evangelist for Data.gov. “We listened to users, and they wanted a more dynamic, up-to-date design and stronger search,” she said. So the team tried to make the site more responsive and engaging, and “we gave it a Tumblr-like feel,” Holm said. The site they created was a page with lots of elements that seemed bloggy and more “social.” The site was made fully functional at a public URL (Next.Data.gov) so that people could watch the design happen and give feedback over time. 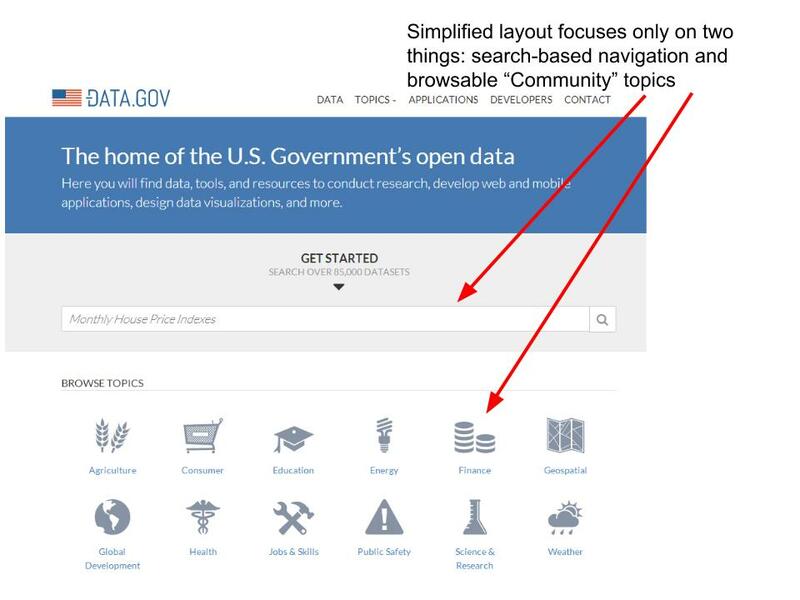 Without a structure – without compartments that house the data and give it context – people didn’t know where to go. 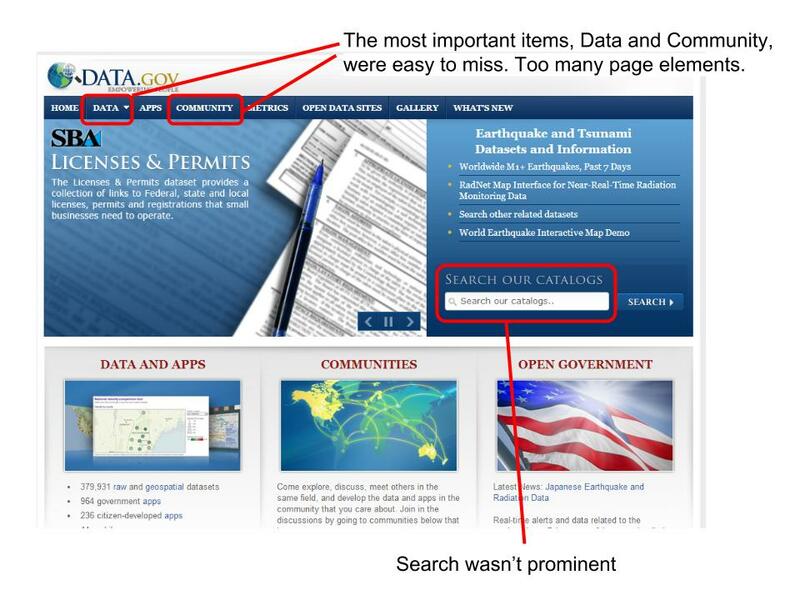 Through a second round of usability testing, the Data.gov team found that people ignored the “floating content” at the bottom. Instead they navigated through the links on the left-hand side – education, energy, etc. These links were originally under the “Community” tab in the first version. The prominent search feature on top wasn’t enough – customers wanted the ability to both search AND navigate to their information. Now, they made the communities front and center and called them “topics.” The icons draw people’s attention to them as the sole graphics on the page. It gives equal time to both the search-based navigation on top, Google-style, and then the icons below. User feedback has been very positive and there are more ways for citizens to contribute to, interact with, and comment on content on the site. But, the team continues to collect and act on feedback that they collect through numerous channels on traditional and social media and at events, and post and respond to them publicly on Data.gov’s Github page. That turns data collection into a two-way conversation. 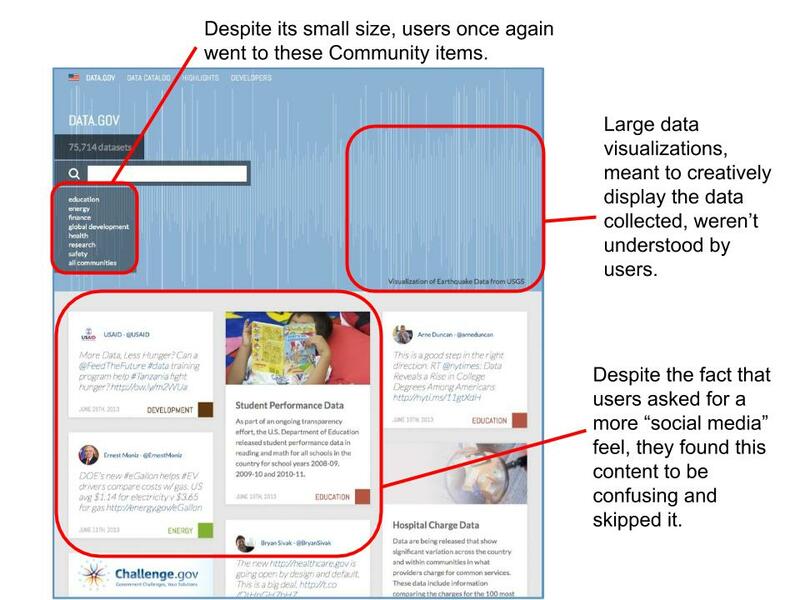 Interested in interacting with other user experience enthusiasts across government? Join the User Experience Community.